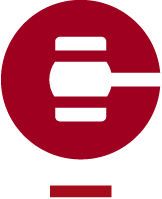 Consignor’s Fall Live Auction of Canadian Art presents an impressive selection of abstract painting from artists across the country and through the decades. Early ventures into abstraction in Canada occurred in the 1920s and 1930s, although they were sporadic and inconsistent. These artists, notably Kathleen Munn, Bertram Brooker, Lawren Harris and Jock MacDonald, were heavily influenced by European artistic movements, namely Cubism, Surrealism and Symbolism. An examination of the abstract works in Consignor’s November sale can help illustrate the story of how abstraction emerged and developed throughout Canada in the following decades. In the 1940s, Montreal gave rise to the highly-influential Automatistes, Canada’s first avant-garde art movement. Under the leadership of Paul-Émile Borduas, a group of young artists rebelled against their artistically conservative and politically and religiously repressive province. They strove for creative spontaneity, free from academic rules. After reading André Breton’s “Le Surréalisme et la peinture” in 1945, Jean-Paul Riopelle was inspired to break away from tradition to pursue non-representational painting. 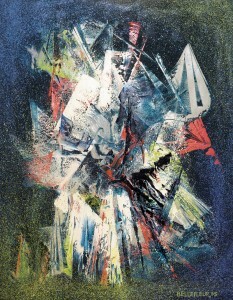 The young artist created several small watercolours in the next two years, consisting of web-like black lines, inspired by Surrealism and Breton’s automatic writing techniques, such as Sans titre of 1946, lot 6 in Consignor’s November sale. Another member of the Automatistes, Marcelle Ferron was encouraged by Borduas to abandon landscape painting in favour of a more radical abstraction. 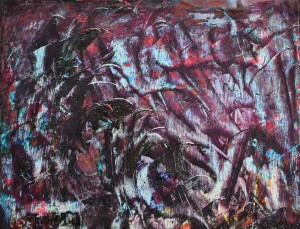 From 1946 to 1953, Ferron preferred a ‘sgraffito’ technique, applying multiple layers of pigment and scraping away between applications with a palette knife. This signature approach of Ferron is exemplified in the colourful layers of paint in Sans titre (1949), lot 101 in the Live Auction. In the following decade abstraction spread across Canada. Toronto exploded as an art centre in the 1950s, largely influenced by the Abstract Expressionists in New York. 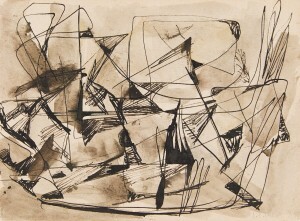 Harold Town was a founder and member of the Painters Eleven, a group of Toronto abstract artists that exhibited together during the 1950s. Rich colour and thick paint application, as exemplified in Clandeboy Reprise (1959), lot 71, are characteristic of Town’s approach to abstraction, inspired by the New York School. 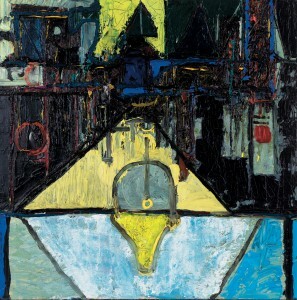 Contemporary artist Michael Snow exhibited in Toronto in the mid-to-late 1950s at the Greenwich Gallery. Though today he is known as a pioneer of conceptualist and multimedia art throughout the world, Snow’s work of these years were also heavily influenced by American abstract artists such as De Kooning, Kline, and Rothko. Off Minor (1958), lot 25 in Consignor’s November auction, exemplifies Snow’s affiliation with avant-garde abstract movements at the time, shortly prior to creating his famous Walking Woman Works. 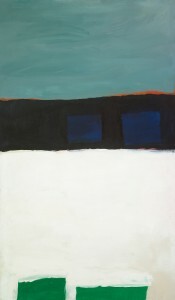 A notable and influential group of Canadian abstract artists formed in Regina in the 1960s, known as the Regina Five. Founding member Ron Bloore was instrumental in starting the Emma Lake workshops as a way for practising artists to break from the artistic isolation they felt in the prairies. As a professor of art history and archaeology, the influence of archeological excavation and ancient civilizations worked their way into Bloore’s painting.The monochromatic palette of Untitled, lot 86, references the white marble buildings and sculptures of ancient Greece and the Classical period. During the Emma Lake Artists’ Workshops held in 1962-63, Saskatchewan artist William Perehudoff was introduced to Post-Painterly Abstraction by art critic Clement Greenberg and American artist Kenneth Noland. Many of the artist’s wide horizontal canvases of the mid-to-late 1970s are composed of vibrant parallel bands of colour, such as AC-78-20, lot 11 in the live auction. The effect of the flat plains and open skies that are so dramatically present throughout Saskatchewan is often detectable in Perehudoff’s work – AC-78-20 may be evocative of a prairie sunset. Jack Shadbolt was an innovative and dominant figure in the Vancouver art scene beginning in the 1940s. Shadbolt drew from many sources of inspiration, including Cubism, Surrealism, American Regionalism and Northwest Coast art. The artist met Emily Carr in 1930 while attending Victoria College. Carr left a strong impression on Shadbolt’s life and work; they were both inspired by the spiritual unity with nature that is apparent in Northwest Coast art. 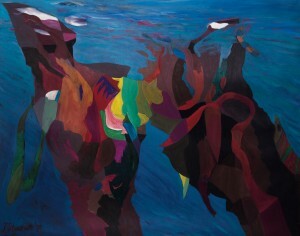 Sea Edge 5 (1978), lot 9, is exemplary of Jack Shadbolt’s bold and colourful work of the late seventies. Sea Edge 5 serves as part of a series on the theme of abstracted seascapes, and Contexts: Variations on Primavera Theme, lot 10, is one of 15 hand-painted posters of the ‘primavera’ theme, which together form a mosaic-like mural. Abstract painting in Canada has continued to evolve through a multitude of approaches in the 1970s, 80s and through to today.  Lot 8, Rituel, by Léon Bellefleur, Lot 31, Spring Yellows – B by Gershon Iskowitz, and Lot 103, Les feuilles d’un astre by Jean-Paul Jérôme, among many other non-figurative artworks in Consignor’s Fall Live Auction, demonstrate the enduring development of unique abstract styles throughout the country, from the ‘gestural’ to the ‘hard-edge’. Visit our gallery and view the full catalogue on the Consignor website for more artworks and details regarding the Fall Live Auction of Important Canadian Art on November 23rd at the Gardiner Museum.